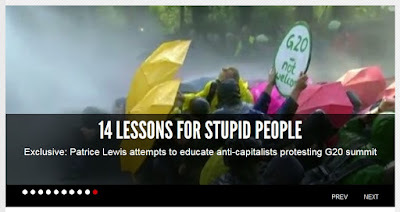 Here's my WND column for this weekend entitled "Fourteen lessons for stupid people." I'm honored they selected it to run in the slider on WND's main page. I love reading your columns - as you say the things I think and make it sound smart! Great column! These protester are part of a traveling carnival, they show up when ever and where these events occur. It's doesn't matter with it's in Hamburg or Seattle. So who is footing the bill to make there travels possible? I would be curious to know? Awesome article Miss Patrice. Just the kind of things a lot of us would like to say to the "stupid people". i, too, want to know who pays them. one was interviewed on either 'france 24' or 'deutsche welle'. what a miserable way to see the world. Political violence in Hamburg Germany is of little concern when two of America’s most politically violent cities are virtually next door. Portland OR has earned the distinction of ‘America’s Most Politically Violent City’ as reported by Politico. Sorry Seattle, close but no cigar. ‘Weird People’? Try ‘Stupid People’. Love your column!! Excellent!! But, I always do like and enjoy your columns. I like that YD is in the Navy...wanted to join also many years ago but parents said no. Am sure she is doing OK. Very well stated. I have sent this article off to all my friends. We have two daughters about the age of yours. I am proud to tell others about your family and your self suffiency accomplishments. Keep up the hard work.